I didn’t start out life as a writer, although I’ve always known it was something I wanted to do. I’ve always been an avid reader and recall the first moment I realized that books were the entryway into vast new worlds. The setting was at our family cabin in a remote part of Iowa. A sand-bottom river runs by my dad’s property and we’d just come in from an afternoon of playing and had received the obligatory cold-shower from Mom by the water-pump. We didn’t have indoor plumbing, but as a I kid I neither knew or cared. Having swum, and now with chattering teeth I wrapped up in a blanket and wondered what next could I could do. It was then that Mom handed me the first Tarzan of the Apes book by Edgar Rice Burroughs. I was instantly enthralled and read through the entire serial while on that vacation in the woods. As it turns out I have an older sister who is an even more avid reader and was working through a life change where she suddenly found herself with a master’s degree and no job. Oddly enough, she happened to be living at that same cabin in the woods, where I discovered my love of reading. She spent an entire year publishing the first four novels of her popular Bellingwood series. At Christmas, she shared with me that she felt she could make a go of publishing. To say I was gob-smacked is an understatement. That January, I started writing in earnest and published my first science fiction novel – Rookie Privateer, in April. That was three years ago and I haven’t slowed down, even for a moment. Great question, I was just talking to my sister about this last night. I came from a very loving family. It wasn’t without problems, mind you, but I had a father who regularly held the hands of his children and a mother who enjoyed being around us. I love exploring dark subjects within Urban Fantasy and Paranormal genres. But for me that’s the setting and the conflict. My stories are almost always about how friends and family find ways to overcome the great evils they run into. There are several things. I’m goal oriented and enjoy the completion of a task. I’m also a perfectionist and I need to have things done well. There is a satisfaction I feel when I hit the button to submit a manuscript to be published that I know all work is complete and I’ve accomplished. And while, that satisfaction is nice, it is nowhere near as rewarding as the responses I receive from readers. Some are funny – people simply sharing a part of their life and reaching out because that’s who they are. While others are heartwarming, often where a reader found something I wrote particularly applicable to their lives. For me, writing is a journey I share with readers, I would quickly loose interest without that interaction. Marketing and time management. Many readers are unaware that self-published authors are responsible for marketing their own works. You either get good at it quickly or you sink into oblivion. Time management is also a huge challenge for me. As I have a day-job and an active family, I’m constantly searching for quiet moments where I can get to my happy-spot and write. To borrow from Nike – Just Do It! Seriously, stop thinking about it and start writing today. www.fickledragon.com is my website. My email address is jamie@fickledragon.com. You can also find me on facebook at facebook.com/jamiemcfarlaneauthor. Late one night, a teenaged witch witnesses her uncle perform the forbidden ritual to summon a demon. His carelessness results in the demon breaking free and being released into the world. Drawn to the young witch’s powers like a shark, the demon is only temporarily thwarted when she manages to escape. Felix Slade is a wizard living far from the family he grew up with. Recently he’s been unable to sleep as night after night a beautiful young witch is stalked by a demon in his dreams. Each night, new details are exposed and Felix is soon convinced that it’s up to him to prevent the woman’s demise. The dreams reach a critical point when Felix’s own family is threatened by the violence he’s sure is yet to come. With his sister and the woman he loves by his side, Felix rushes to face the greatest challenge he’s encountered yet. There is great darkness inside him and he must choose to embrace or reject it in order to face the demon’s evil. Lace Faa stared out at the waning crescent moon through the wavy glass of the old farmhouse window, wishing for even the slightest breeze. The day’s heat refused to dissipate from the humid, summer air which clung to her as she tried unsuccessfully to fall asleep. As if on command, a slight puff of wind rustled the sheer curtains of her second floor window, carrying with it the faint sound of chanting. She strained her ears, curiosity piqued, wondering who might be working her family’s hidden craft so late at night. Her gaze shifted to the barn across the gravel driveway. A flickering glow between weathered siding exposed the presence of lit candles and a ritual in progress. She dropped her legs over the side of the bed and placed her feet in just the right spot to keep the weathered floor from creaking. At the age of sixteen, Lace wasn’t fully initiated in the subtle magics of her kin, but moving silently had been drilled into her from an early age. She walked carefully, rolling from heel to toe along the unseen joists that supported the floor, avoiding loose boards as she slipped from bedroom to hallway. The hem of her white cotton nightgown thumped quietly, caressing the wooden stair treads as she descended to the kitchen. For a moment, she paused at the screen door and considered its habit of screeching when opened. Wetting forefinger and thumb in her mouth, she rubbed them on the old, rusted top hinge. Tall and slender, Lace slipped through the door, opening it only a crack. Relief from the heat held in the old house was welcome as she picked her way gingerly across the gravel. Her eyes focused on the flickering light leaking from the ancient barn. Lace negotiated the piles of junk that had found their final resting place next to the building and carefully placed both hands on the rough siding, leaning forward to look through one of the many cracks in its façade. Her eye came to rest on the edge of a white circle, drawn on the dirt floor only feet from her position. With her limited view, she glimpsed two black candles burning brightly at the tips of what she suspected was a pentagram, although without full view of the circle, she couldn’t know for certain. “Phezore Gesteriph Feoro, I summon you.” The bold voice, her uncle Willum Gordon’s, resumed chanting in the ancient language Lace believed was only known by her extended family. Her heart thudded in her chest, recognizing the simple ritual – if only from her reading. “Oh, Willum,” she whispered involuntarily before bringing her hand to her mouth. “Who’s there?” Willum asked loudly from within the barn. Lace stepped back, startled, catching her heel on a piece of long forgotten machinery. She spun, trying to save herself, but in the poor light her knee came in contact with a stack of precariously balanced wooden crates. She lunged from her position, diving away from the collapsing junk, all pretense of stealth abandoned. The tall door of the barn slid open as she twisted, trying to free her legs. “Madge?” Willum asked, the low angle of wavering candles illuminating him eerily from behind. Lace hastily scrawled a rune in the air with her finger, turning away from Willum’s position so he wouldn’t see the faint sparkling trail as she did. As an initiate of her clan’s magic, she’d mastered the one spell that had come easily to her – shadow walk. Willum stepped from the barn, closing the door behind him. Lace used the noise to her advantage and gained her feet, moving slowly from her original position. Willum turned and stared directly at her, standing stock still – a hunter trying to locate its quarry. Lace froze. She knew him to be cruel when cornered and he would not take kindly to her spying on his ritual. A weak practitioner by family standards, he’d often taken out his frustrations on her. With the provocation of an interrupted ritual, Lace well understood the danger she’d placed herself in. Willum took a few steps forward, cutting the distance between them in half. Lace breathed slowly, trying to calm her heart, the lack of oxygen demanding deeper breaths. Swiping the air between them, Willum moved toward her. Slowly, she stepped aside, anticipating his movements. Sweat beaded on her forehead as his fingers came within inches of her face. Jamie McFarlane is a graduate of Colorado School of Mines with a Master of Science in Mathematics. An avid reader, tinkerer, woodworker and metal sculptor, Jamie is just as likely to be seen smelting aluminum cans in his garage as he is tacking random, discarded iron objects into a small army of beasties that adorn his home’s landscaping. Jamie’s writing career began as something of a dare which later turned into a tribute. In his late teens, Jamie was well known as the family story-teller, spinning fanciful yarns about ordinary events, usually with the objective of escaping well-deserved trouble. One day, his mother, often the target of his mischievous tales, challenged him to commit his words to writing. Jamie promised he would but time passed, as did his beloved mother. In 2014, Jamie made good on his promise and published his first book. Jamie is the author of a growing library of novels and novellas including the space opera series – Privateer Tales, and the urban fantasy series – Witchy World. Jamie lives in Lincoln, Nebraska with his wife and enjoys spending time with family and friends. 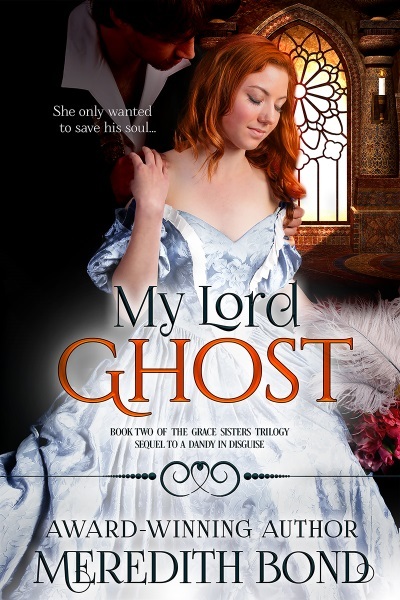 Today, we are excited to announce the release of My Lord Ghost, book two of The Grace Sisters Trilogy. Sweet, warm and alluring, My Lord Ghost is the new romantic novel by award winning author Meredith Bond that promises to captivate your heart. Buy now! My Lord Ghost is available on sale at Amazon, Barnes & Noble, Kobo and Smashwords. Also, read on and find out how you can join My Lord Ghost Giveaway Contest and WIN! She only wanted to save his soul. He needed to save her life. Laia Grace wasn’t raised in society and besides, meeting men was so much fun! But when the naive Regency miss introduces herself to the wrong person, her father decides that it’s time she grew up. If only he knew that the house he was sending her to had a ghost in residence. Marcus is haunting his own home, living in the secret passages and priest holes while he tries to deal with the horrific events that led to his brother’s death. But when an angel shows up and coaxes him into telling her his story, he discovers a reason to live. Will he be willing to risk both his own life and his heart to save her? Join My Lord Ghost giveaway contest! 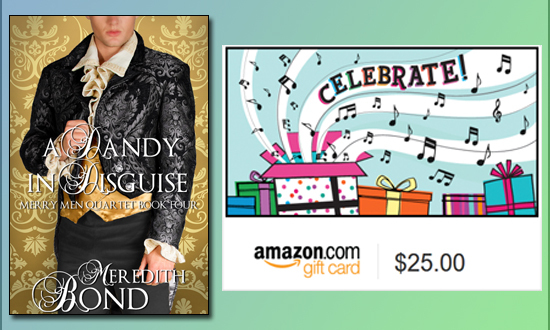 Get a chance to win A Dandy in Disguise eBook by Meredith Bond (Book One of the Grace Sisters Trilogy) and a $25 Amazon Gift Card! Be sure not to miss Book One of The Grace Sisters Trilogy by Meredith Bond. If you gamble with your future, you’re bound to lose. Rose doesn’t realize this when she puts her money down. She’s new to society, and mistakenly thinks everyone is who they claim.Fungy doesn’t know who he is anymore, but Rose makes him want to be the best he can be. But is he the best man for her? A turn of the cards might have the answer. Meredith Bond’s books straddle that beautiful line between historical romance and fantasy. An award-winning author, she writes fun traditional Regency romances, medieval Arthurian romances, and Regency romances with a touch of magic. 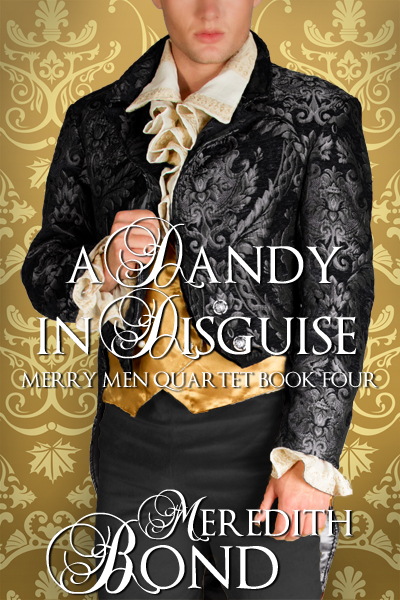 Known for her characters “who slip readily into one’s heart”, Meredith’s paranormal romances include her Storm series set in during the English Regency, her post-Arthurian fantasy series, The Children of Avalon, and a series of traditional Regencies—without magic—called The Merry Men Quartet. Her newest series, The Grace Sisters, is a spin-off from The Merry Men Quartet. She has also written two non-fiction books: Chapter One: A Fast, Fun Way to Write Fiction and Self-Publishing: Easy as ABC. “I wondered about that.” Another voice behind her. Lexa turned and coloured, realising that in her wonder she had completely ignored the stranger in the room. “Oh! I am Sorry! Dr. Lexa Horne of the Imperial War Museum.” She held her hand out. “The pleasure is entirely all mine,” Lexa told him in all earnestness. “This is simply unbelievable. This is like walking into heaven for me.” Ok. A small lie. Dead men and unexploded ordinance aside, it was heaven. Lexa gasped as she saw the body at the desk. He was perfectly mummified, just as Darby had told her. He was hunched over, as if sleeping, and his golden hair gleamed in the light. His skin was the colour and texture of tanned leather, and his lips under a large moustache had pulled back to show his teeth. His head lay on on crossed arms, sunken eyes closed in eternal repose. The fingers were slightly curled; a large ring on one hand and a wedding ring on another. His light blue uniform hung on what was left of his frame, but was in decent condition through the shoulders. In fact, there were no real decomposition of the fabric. His side arm rested on the chair, the belt having slid down with time. The silver bullion on his uniform had a dull tarnish and the aiguillettes on his shoulder seemed suspended as if by magic. Beside him, his uniform cap was on the desk. “It also feels a bit indecent to be looking at him.” But she found she couldn’t tear her eyes away. It was the moustache. The moustache was so familiar. Even in death, it had that upwards curl which was so familiar. A vain bushiness. When she had seen it in pictures, it always made her smile. “I think I know who this is!” Lexa exclaimed and reached into her bag for her iPad. Noon Onyx is back! In this long-awaited fourth installment, Jill Archer returns readers to the dangerous world of Halja, where demons, angels, and humans coexist in an uneasy state of détente. Far to the north lies an outpost famous for its unrest – Rockthorn Gorge. The town’s patron has specifically requested Noon’s help. Her assignment? Help the neophyte demon lord build his fiefdom and keep what’s his. The problem? Lord Aristos – Noon’s new employer – is her erstwhile lover, Ari Carmine, the aforementioned heartbreaker. And the number one thing he wants is her. When Rockthorn Gorge’s viaduct is destroyed by Displodo, an enigmatic bomber, killing a dozen settlers and wounding scores more, Noon sets off early to aid in the search and rescue. Ari is listed among the missing and the suspects are legion. But Noon’s search is just the beginning. Her journey forces Noon to confront not only those she loves, but also enemies hell-bent on destroying them. The claw-and-ball had been chewed clean off. It lay on a patch of sunny parquet floor, just to the right of an antique, aubergine wool rug now covered with the splintered remnants of an eleventh century pedestal table and one very large, ghastly looking, somewhat repentant barghest. Nova’s head rested on her front paws as her gaze shifted warily from me to Miss Bister, Megiddo’s dormater, or house mother. I opened my mouth to respond, but Miss Bister continued speaking, her tone rising only infinitesimally, her back as stiff as Luck’s lance must have been, and her expression just as hard. She pointed toward the previously priceless, three-footed piece of furniture that was now a worthless, two-footed pile of kindling. I couldn’t really argue with Miss Bister either. Everything she’d said was true. And who was I to tell her what she should deem important? I respected that she valued domestic order and antiques. I did too, if not nearly as much as I valued the thing that now threatened our continued access to such. I glared at Nova, who swept one paw over her eyes as if she could hide from me and the evidence of what she’d done. Barghests are giant hellhounds. They’re bigger than bears, fiercer than rabid raccoons, and uglier than naked mole rats. Their teeth are the size of railroad spikes, their claws as sharp as a sickle, their breath as foul as sewage gas. But they are also affectionate, brave, and loyal. What barghests lack in magic, they make up for in devotion. And even though I was plenty mad at Nova for chewing up Miss Bister’s table, I also knew it wasn’t Nova’s fault. It was mine – for thinking the lobby of a demon law school dormitory would be a good place to keep her. I stared at the small, frail, magicless woman in front of me, trying desperately to think of some way to fix this problem. Wasn’t there something I could do, or say, or offer her that would make amends and convince her not to kick us out? But all I could think of was how useless some of the things our society valued most were. As Miss Bister had pointed out, neither magic nor money would help. If I was going to repair the table, I’d need to find another way. Which would take time. And that meant I’d need to find somewhere else for us to sleep tonight. Because if the beast was going… I was too. She narrowed her eyes, slightly suspicious of my now gracious defeat since I’d just spent the last half-hour trying to persuade her to accept various forms of reparation. But then she nodded, handed me a couple of paper bin bags, and left. I slid one bag inside the other and stooped down to pick up the slobbery remains of Nova’s mangled chew toy. When I finished, she came over to me and nudged my arm with her head. She let out a woofy whine. Was she sorry? She darn well better be! I gave her a scratch behind the ears. Media Kit: Pocket Full of Tinder – Bonus Giveaway! Anyone who tweets one of these will be entered to win ANY fantasy book of their choice from Book Depository (so long as Book Depository ships to your address) (up to $10.00). Contest ends on September 30, 2016. One tweet/entry per person per day. Lucem in tenebras ferimus. Into the darkness, we bring light. My right hand flexed, an instinctive precursor to shaping a weapon. My body soared, my stomach dropped, and my perspective of the world changed forever. Armageddon is over. The demons won. And yet somehow…the world has continued. Survivors worship patron demons under a draconian system of tributes and rules. These laws keep the demons from warring among themselves, the world from slipping back into chaos. Noon Onyx grew up on the banks of the river Lethe, daughter of a prominent politician, and a descendant of Lucifer’s warlords. Noon has a secret—she was born with waning magic, the dark, destructive, fiery power that is used to control demons and maintain the delicate peace among them. But a woman with waning magic is unheard of and some will consider her an abomination. Noon is summoned to attend St. Lucifer’s, a school of demon law. She must decide whether to declare her powers there…or attempt to continue hiding them, knowing the price for doing so may be death. And once she meets the forbiddingly powerful Ari Carmine—who suspects Noon is harboring magic as deadly as his own—Noon realizes there may be more at stake than just her life. Lucifer and his army triumphed at Armageddon, leaving humans and demons living in uncertain peace based on sacrifice and strict laws. It is up to those with mixed demon and human blood, the Host, to prevent society from falling into anarchy. Noon Onyx is the first female Host in memory to wield the destructive waning magic that is used to maintain order among the demons. Her unique abilities, paired with a lack of control and reluctance to kill, have branded her as an outsider from her peers. Only her powerful lover, Ari Carmine, and a roguish and mysterious Angel, Rafe Sinclair, support her unconventional ways. After years of denying her abilities, Noon Onyx, the first woman in history to wield waning magic, has embraced her power. She’s won the right to compete in the prestigious Laurel Crown Race—an event that will not only earn her the respect of her peers but also, if she wins, the right to control her future. Jill Archer writes genre-bending fantasy from rural Maryland. Her novels include Dark Light of Day, Fiery Edge of Steel, White Heart of Justice, and Pocket Full of Tinder. She loves cats, coffee, books, movies, day tripping, and outdoor adventuring. All my life, I’ve had plans. Dying the day before beginning the final year of my surgical residency wasn’t one of them. Finding myself drafted in the eternal war between good and evil wasn’t one of them, either. And dealing with friends, enemies, and lovers I don’t remember? Definitely not in my plans. Even the best ones can go awry. And when they do… all hell breaks loose. If I’ve learned only one thing in the last few months, it’s the past never dies. Four plagues down. Six more to come. We need more than a plan. They require a deity who cares. And if you don’t have one of those… you need a sacrifice. –For me, as a lifelong reader, it’s always been about the story. The desire to see a certain kind of story and share it with others is what propelled me in to writing. –This sort of goes back to the previous question and answer, in the sense that I really wanted to read about a certain type of character and then I wanted to share that with other people. Luckily, other people found that first character and her exploits as enthralling as I did and I’ve been sharing those stories and others with people ever sense. –I get asked this a lot and I don’t really have an answer. I want people to take away whatever they need in that moment. If they’re reading for escapism, I hope they enjoy a few hours away from the real world. If they’re looking for hope that they, too, can make it through hard times, I hope they find that. Again, I really hope people are able to find their own answers in whatever they read. –Being able to share my ideas and thoughts with other people. I’m a person who, while I can get very vocal when I’m passionate about something, in general does not like talking with people. Writing is a way for me to communicate with the world and I’m so grateful for that opportunity. –I would say the finality of publishing something—once it’s out in the world, it’s there. If you haven’t made yourself and, as a result, your characters, clear enough, there’s a lot of room for misinterpretation. This misinterpretation can and usually does lead to negative or so-so reviews, which are always disheartening. –Read everything, including your reviews. Don’t respond to them but definitely read them and learn from them. Some of the best criticism I’ve received has come from reviews and I’m sure that’s the case with other writers. The key is being able to accept that criticism and analyze and learn from it and not write it off because it might be harsh or hurtful. I’m on both Facebook and Twitter and you can always contact me through my website. L.M. Pruitt has been reading and writing for as long as she can remember. A native of Florida with a love of New Orleans, she has the uncanny ability to find humor in most things and would probably kill a plastic plant. She knows this because she’s killed bamboo. Twice. 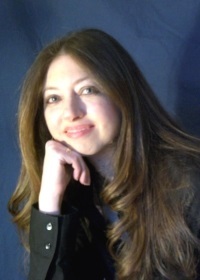 She is the author of the Winged series, the Plaisir Coupable series, Jude Magdalyn series, the Moon Rising series, and Taken: A Frankie Post Novel.